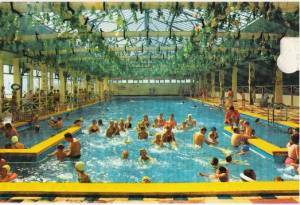 The camp which started it all, Skegness was the first venture by Billy Butlin into the new and uncharted waters of British holiday camps. Sitting on 200 acres of a former turnip field, the camp has deservedly earned it's place in the hearts and minds of British holiday folklore. Construction began in September 1935 and work progressed throughout the harsh winter. Many problems were encountered, including a distinct lack of funds at one point. Butlin designed the camp himself with many of his sketches and ideas appearing on the backs of cigarette packets. He said "my plans were for 1,000 people in 600 chalets with electricity, running water, 250 bathrooms, dining and recreational halls. A theatre, a gymnasium, a rhododendron bordered swimming pool with cascades at both ends and a boating lake. In landscaped grounds, there were to be tennis courts, bowling and putting greens and cricket pitches". The camp opened it's doors on 11th April 1936 and was an immediate success, despite many early teething troubles. This was to be a luxury camp, at prices that working people could afford. Three meals a day, and free entertainment from 35 shillings a week (£1.75). 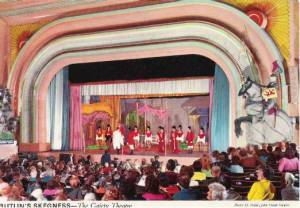 The capacity was increased from 500 to around 1,200 during the first season, and at the end of the year another £40,000 was invested to build a dining room, theatre and gymnasium and to increase the capacity to 2,000. The camp eventually went on to accommodate close to 10,000 holiday makers. On the outbreak of war in 1939 the campers were immediately sent home and the site was taken over by the Royal Navy. The camp became a training establishment and was known as HMS Royal Arthur. The beer garden became the sick bay, the Fortune Teller's Parlour was the dentist's office and the Viennese Dance Hall became the armoury with stacks of rifles. Air raid shelters occupied the former rose gardens and the brightly coloured paintwork disappeared under a dull military scheme. However the camp was respected and looked after by the Navy, despite constant attacks from the Luftwaffe - some 52 bombs landed on it! At the end of the war the site was handed back to Butlin's and work soon commenced on bringing the camp back into life as a holiday resort. It reopened on 11th May 1946, only 6 weeks after leaving the Navy's ownership. In 1948 Billy Butlin opened his own airport next door which dealt with passenger and freight charters, along with local pleasure and sightseeing trips. A hotel (the Ingoldmells Hotel) and a theatre (the Butlin Theatre, later renamed the Gaiety) were also built adjacent to the main road and were both open to holidaymakers and the general public alike. The chairlift was opened in 1962 and ran from the south side of the camp right up to the north, it was the longest in the Butlin's empire. 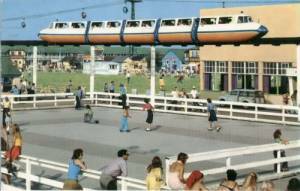 The first commercial monorail in the UK opened here in 1965. Also in 1962, Ringo Starr and his group Rory Storm and the Hurricanes, arrived to play the summer season at Skegness after two successful years at Pwllheli. During that summer John Lennon and Paul McCartney visited the Skegness camp and met with Ringo to discuss future possibilities. This eventually led to a request to join their band, conveyed in a phone call to the camp from Lennon on Tuesday 14th August. Despite having two weeks left on his contract, Ringo gave his group three days notice and on 18th August 1962 sat down behind the drum-kit of the Beatles. On that night the Fab Four were born. The camp continued to prosper and in 1987 benefitted from a £14 million investment and improvement scheme, including a change of name to Funcoast World. It was refurbished again in 1999 which included the construction of over 1,000 brand new apartments including some very attractive 'New England' style buildings. The centre now has 7,500 beds and employs 300 full time and 1,000 seasonal staff. It also has its own caravan park which contains over 500 privately owned static vans. One of the original 1936 chalets is now preserved as a Grade 2 listed building. The centre looks set for a long and secure future.